Acrylic on Canvas, 59 x 78.5 inches. Acrylic on Canvas, 60 x 96 inches. Acrylic on Canvas, 48 x 72 inches. Acrylic on Canvas, 45 x 40 inches. Acrylic on Canvas, 16 x 16 inches. Acrylic on Canvas, 36 x 72 inches. Acrylic on Canvas, 48 x 36 inches. This exhibit introduces the concept of inflexion and showcases the many manifestations of beauty according to my intentions under current influences brought about by intuitive decisions. These works attempt to pull back our senses back to the natural. Flowers are the source of my inspiration for they waken our senses to the extraordinary. Their beautiful foliage and blossoms only last a brief moment yet their impression, enduring. I aim to the capture the magic they leave behind that allow us to marvel once again. Jemina’s “The Unfolding”, referencing the mystical process of a flower’s blossoming, bursting into the full glory of gentle and delicate petals unfurling for our aesthetic delectation. In her large canvases, Jemina nourishes our memories of flowers we have loved: roses, carnations, amaryllis, lily of the valley, daisies, carnations, morning glory, chrysanthemums, and daffodils, with all their sparkling evocation of colors ranging from incarnadine reds, warm oranges, and vibrant yellows, flecked by leaves of viridian greens, and catching hazy glints of skylight. Doing this collection brought me full-circle in my profession. I did two simultaneous shows when I first started exhibiting, one of which was “Casa Manila” in 1996. This collection presents my affinity to Spanish architecture. When I was invited at Galeria Roces to exhibit, I was immediately charmed by the place. I wanted to therefore paint pieces that would further support its appeal. This time, instead of the familiar sepia renditions, I chose either red to liven-up it walls or blues to harmonize with its environment. In this exhibit, I hope to bring the city’s own quaintness and splendor for everyone to enjoy and remember. I am inspired by the intensity of feelings whether it is love, passion, anxiety or hope. My paintings are personal but however personal the emotions are universal. Take a simple object like the rose. Each person will see it differently. To a romantic, it is love. To a perfumer, it is fragrance. To a botanist, it is a plant. So much about life and us get “Lost In Translation” . I chose a limited palette to define our colorful world. The paintings are not photographic, many details are lost but the heart is there. For this collection, I hope each viewer would be able to take the essence of the art and relate them in their own lives. 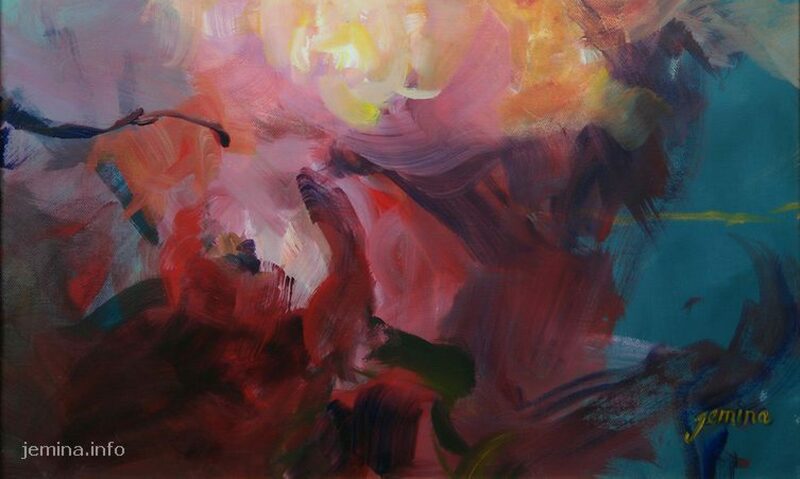 The title of the show alludes to the famous quotation of the American poet Robert Frost: “Poetry is what is lost in translation.” In these recent works, Jemina, an avowed Abstract Expressionist, reflects on the queen of all flowers, the rose. The subject references Shakespeare’s line, addressed by Juliet to her Romeo: “What’s in a name? That which we call a rose/ By any other name would smell as sweet.” The artist’s trademark feathery brushstrokes swirl gently, forming the shape, density and texture of roses. Male and female figures embody the artwork’s romantic dynamics.